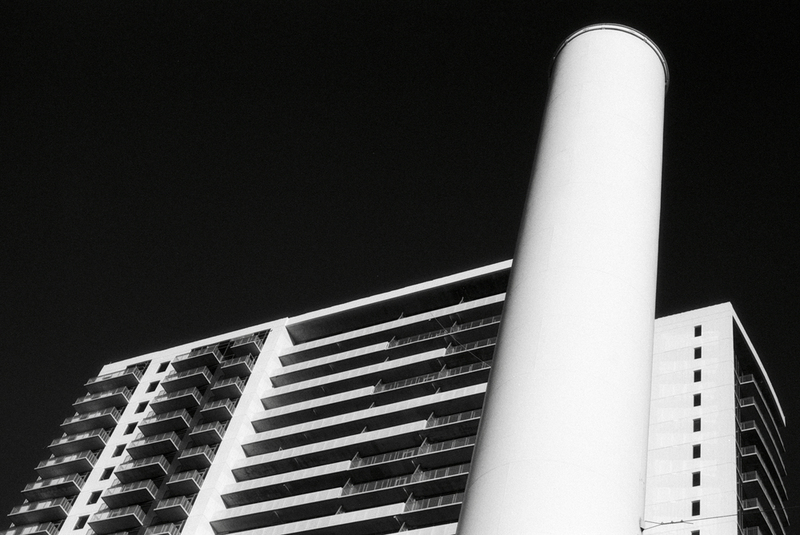 I was wandering around downtown Austin a bit last week, shooting a roll of black and white film. A personal goal of mine is to shoot a roll a month and I'm really behind in that endeavor lately. My little outing was long overdue. I needed an analog photography fix. Call me a luddite if you want. Technology is wonderful and the advances in modern cameras are truly amazing. Still, there is nothing like the experience of shooting film, especially a purely manual camera where the only controls for exposure are shutter speed and aperture. Ah, simplicity! No screens of menus or fiddly dials and buttons. I was shooting an Olympus OM1N this day. No meter, just experience and instinct to judge exposure. The old Seaholm Power Plant is now a shopping center. The smoke stacks remain and the main building still has the old Art Deco signs and accents. I was playing with a red filter on the lens and the stacks made for nice contrast against a darkened sky. The film was a roll of Poly Pan F that I bought from the Film Photography Project a while back. I'd never used it before. There were some interest frames on my roll and I think I might try this one again sometime.